Four Seasons hotel boston m.a. This project was not built by Apex Green Roofs, but has since become a success story in green roof revitalization. The green roof was designed to have stripes of blue-green and yellow-green species. The design had an immediate visual impact, but required extreme maintenance to stay in keeping with the design. The project was improperly maintained for several years and the vegetation on this green roof became dominated by a single sedum species along with a number of vigorous weeds. 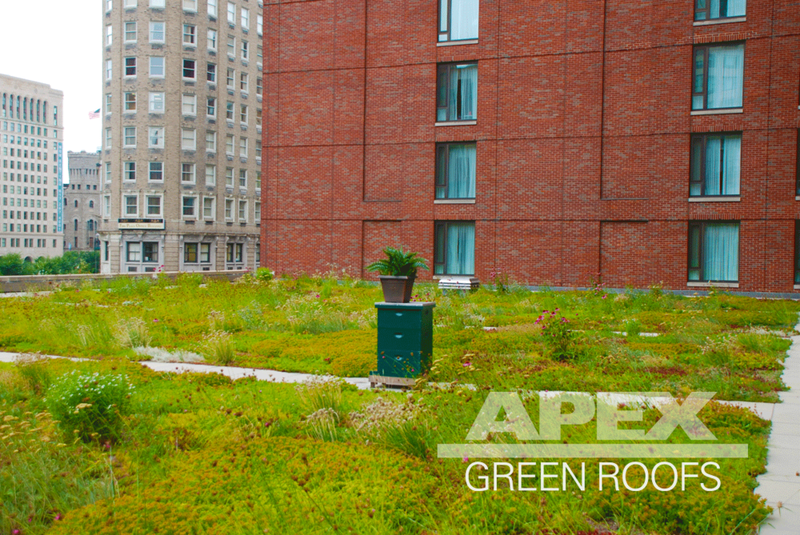 Apex Green Roofs came up with a plan for increasing plant diversity, decreasing maintenance demands and eliminating the weed species. Over the coarse of 2 years the green roof went from a liability for the hotel to and amenity that customers frequently comment on.